The second most common question Iâ€™m asked is: "What subspecies of Congo Grey do I have?" Going back to basic biology one needs to understand a type of trickle down effect. Life starts at the top and can be divided into two "types": animals and plants. Each of these are split into "types." In the animal world we find mammals, insects, birds, fish, etc.. Each of these are further split into "types." Bird "types" are split into flightless birds, water birds, perching birds, birds of prey and parrots, as well as some others. Parrots are further split into "types" known as Genus. A Genus is a group exhibiting very similar characteristics. The Genus is broken down further into "types" known as species. A species is a more finely tuned group whose members share the same general characteristics. AND if that isnâ€™t enough, the species are broken down into even more "types" known as subspecies. The African Grey belongs to the Genus "Psittacus." The Genus is always capitalized so you know you are dealing with a Genus. The species is erithacus which follows the Genus name and is always a lower case letter, thus one knows it is a species of that Genus. When the Genus name is followed by duplicate species names, example being Psittacus erithacus erithacus, one knows there are more than one species in that Genus. One also will know that the duplicate name is the nominate subspecies of that species....in other words, it is the first subspecies that was discovered. Once the Genus and species have been established in published articles, the full spelling may be dropped and the Genus and species names may be referred to by the first letter of each, respectively. Some of the guidelines for defining a subspecies are bone structure, size, shape and color difference, habitat needs and physical separation, such as mountain ranges, canyons, deserts or large expanses of unpopulated areas. Unfortunately, there are many gray areas when defining a subspecies, and much depends on the group of scientists involved. In the Genus Psittacus, there is only one species, which is erithacus, and two subspecies, plus a questionable third. The first is the "Congo" Grey, Psittacus erithacus erithacus, (Genus, species, nominate species); the second is the Timneh Grey, Psittacus erithacus timneh (Genus, species, subspecies); and the third which is believed by many aviculturists to be a variation of Psittacus erithacus erithacus, instead of separate subspecies, is called Psittacus erithacus princeps (Genus, species, subspecies). SO WHAT DOES CONGO MEAN? Now where do all these subspecies of "Congo" Greys fit into the scheme of things? Simply put, they donâ€™t! They are simply variations of the same subspecies based on the areas in which they live. If you refer to the regional map, drawn based on an exhibit from "Parrots of the World" by Joseph Forshaw, the lighter area is the range of the African Grey (P.e.erithacus). It is one continuous range with no physical breaks or barriers. 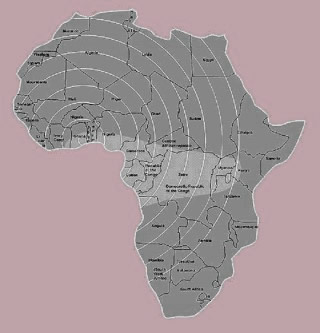 Further, the expanding circles indicate the following: The smallest darkest African Greys, about 300 grams and almost as dark as the Timneh Grey, can be found in the countries nearest the center. As the circles radiate out through the region of African Greys, the Greys get larger. Greys found in countries on the outer fringes of the circles will have the largest Greys, well over 600 grams. I have spoken with people that live east of lake Victoria who claim Greys from the islands in the Lake are in the 700 gram range. As the circle radiates east through the range, the African Greys also get lighter in color, and as the circle radiates south from the center, the color remains the same, a darker gray. Logically, African Greys in the middle circles east of center will be medium in size and color while African Greys on the same circular ring southerly will be the same in size but as dark as the Greys north of them. When people refer to Ghana, Togo, Cameroon, Congo and Angola Greys, they are referring to the region or country from which these parrots originated. These are their "street names" and they refer to "variations," not subspecies. The Cameroon Greys that most people erroneously refer to in the Untied States are large silver Greys. However, these Greys actually came from the old Congo, turned Zaire, and now turned back to Congo region. Originally, the Congo exported their birds, and they were the largest and lightest in color, the Congo Grey. The Congo ceased exporting their birds, but during this era, Africa was exporting birds out of Ghana, Togo, Cameroon and other countries. But of course, by this time, the term Congo Grey was a permanent "generic" label for any red tail. Trappers in Africa were trapping birds in Zaire (the old Congo) and smuggling them to Cameroon. Cameroon would then legally export them out of Africa (legal, but NOT legal). So we in the United States received birds from Zaire* (475-600+ grams) with papers saying the birds originated in Cameroon; and on top of that, we continued to also receive birds that actually did originate in Cameroon (425-500 grams). Brokers decided to get more money for the larger parrots, thus marketing them as Cameroon Greys (also, they had to since it was illegal to have Zaire/Congo birds), and then they sold the smaller darker birds as the common generic Congo Grey (any red tail). Are you confused yet? If not, try this.... We now have Cameroon Greys that are really Congo in origin, and we have Congos that are really Cameroon in origin....We even have Zaire Greys that were imported out of Togo; therefore, so much for the "street names." HOWEVER, after all is said and done, they are ALL one and the same subspecies, the nominate Psittacus erithacus erithacus. *NOTE: Importation of wild caught parrots into the United States ceased in 1992 with the enactment of the Wild Bird Conservation Act.